The Board of School Governors is delighted to announce that Mr Simon Reid, currently Principal of Gordonstoun School, will succeed John Franklin on his retirement as Head Master of Christ’s Hospital with effect from September 2017. Simon’s career has seen him teach in a number of prestigious schools including Brentwood, Stowe and Christ’s Hospital (1993-2004), where he held various posts including Second in the English Department and boarding house master. 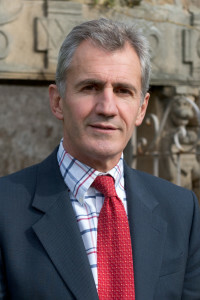 After CH, Simon spent seven years as Deputy Head at Worksop College before taking up his present position at Gordonstoun in 2011. Simon has a BA in English and Politics and a Higher Diploma in Education, both from the University of Witwatersrand, South Africa. His wife Michèle teaches French (her native language) and they have two adult children. Simon’s interests include architectural and landscape photography, writing poetry, reading and skiing. For over 460 years, Christ’s Hospital has been one of the leading charitable boarding schools in this country. By providing bright, but needy children with a first class education and opportunities that they would otherwise be denied, this “school like no other” is, as it always has been, a highly effective agent for social mobility that turns out young men and woman ready to make a positive contribution to society. Irrespective of their background, all pupils are provided with the unique Tudor uniform, full board and all teaching and learning materials. Of the 860 current pupils, 14% (117 pupils) receive a free place, one third (297 pupils) pay less than 10% of the full boarding fee and three quarters of pupils are on some form of means-tested bursary.